Savvy Spending: Target.com: HOT Deal on Seattle's Best K Cups! Pay only 28 cents each and stock up on 96 K-Cups!! 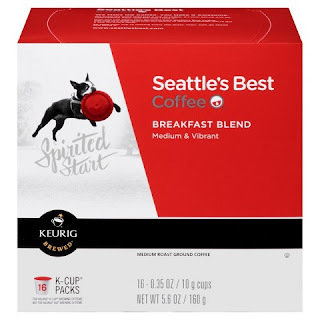 Target.com: HOT Deal on Seattle's Best K Cups! Pay only 28 cents each and stock up on 96 K-Cups!! Wow! Target.com has has a HOT Deal on K Cups... and you don't even have to leave your house! Now through 11/21, Target is offering a FREE $5 Target gift card when you buy 3 select Keurig Brewed K-Cup and K-Carafe Pods. Plus you'll get a FREE $10 Target gift card when you buy $50 worth of groceries. And, you can use code TGTA39R9 at checkout to get an additional $5 off a purchase of $50 purchase. If you're a Target Redcard holder, you'll also get an additional 5% off. All orders at Target ship FREE! 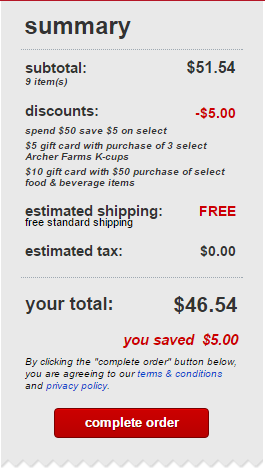 Final Cost after gift cards: $26.54 total for 96 K-Cups (just 28¢ each)! If you have a Target Redcard, you'll save an additional 5% off your total! Be sure to start at Top Cash Back for 2.25% cash back or Ebates for 1.5% cash back. New members also get a $10 sign up bonus!